The body of the Epiphone Casino is made of 5-ply Maple on the back and sides with a maple top and is available in Cherry, Ebony, Natural, or Vintage Sunburst hand rubbed finish. The wood is hand selected and slowly dried until it's has the ideal moisture content for turning it into a guitar. The Casino's F-holes not only add to the sound but also the classic appearance of the guitar. The binding travels both the body and the neck. The trapeze bridge lends to the great visual appeal of the guitar. The 24.75" scale neck is made from a single piece of mahogany for optimum strength and tone. The neck is connected to the body with a dove-tail joint and glue. This also adds to the Epiphone Casino's tone and sustain. It has a rosewood fingerboard with trapezoid inlays and Grover machine heads. Grover tuners have been used for years and offer precise tuning accuracy and stability. The neck has 22 frets and is joined to the body at the 19th fret and has a 1-11/16" bone nut. The Epiphone Casino Archtop's pickups are custom wound and made in the USA while the guitar is made using high quality hardware. The pickup covers are made with German silver and have vintage nickel plating. The wiring is old-style braided and shielded wire. The guitar is made to pickup both the body and string vibrations but also pickup stray interference especially when you turn it up. The pickups are sealed with a special wax that helps to eliminate the microphonic feedback that can come from the internals of the pickup itself (wires, screws, magnets rattling around). The pickup magnets are magnetized by Gibson to ensure the highest quality is maintained. The pickups themselves are vintage single coil type with a P90R in the Rhythm position and a P90T in the Treble position. Each pickup has its own volume and tone controls. The 3-way pickup selector is in the standard configuration: Bridge, Bridge+Neck, Neck. 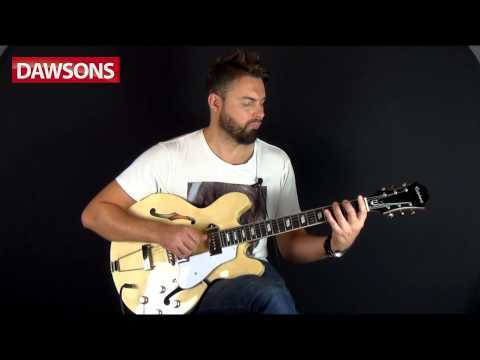 The Epiphone Casino Archtop is a great guitar for jazz, rock, and just about any other style. Posted on 24/11/2015 by DG I have the cherry red model, normally play classical but fell for the looks. Heavy after playing a Spanish guitar and the narrower neck takes some getting used to, tried a few different makes but the Casino felt right and is very playable, the neck feels comfortable in all positions. Used for relaxation and a change from classical, dabbling in blues and jazz - Bach still sounds pretty good on it as OK for finger style. Overall a really nice guitar, well built and finished and sounds as good as it looks.